Prepare 2 glasses. Add 1½ tbsp condensed milk to each glass. Add 2 tbsp coffee into filter. Press down. Sit filter over cup with condensed milk. Pour over 1 tbsp hot water over coffee grounds. Sit for 30 secs. Sit press on top and pour hot water to fill up filter. Place the cover on top and allow to drip onto condensed milk. Add more hot water as required. 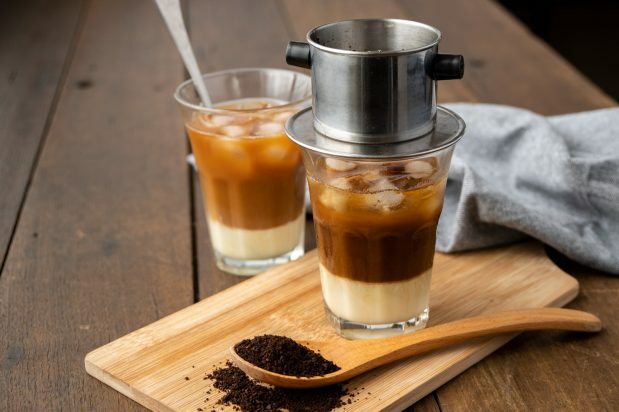 Use a spoon to combine the coffee and condensed milk. Add ice and allow coffee to cool. Enjoy cold.